You can order The Search Engine Optimization Workbook For Lawn Care Business Owner Websites in paperback and as an ebook. We have talked for years about the importance of lawn care business website SEO on the Gopher Lawn Care Business Forum. In fact we have an entire section dedicated to discussions and helping you learn how to improve the rankings of your website in search engine results. Even with all that information on the forum, it can be tough to make heads or tails of it because there are random questions with no real order to help you learn step by step how to improve your lawn care business website SEO. To make learning website seo easier I have put this new book together that helps walk you through steps you can take to improve your website rankings. This new book is called “The Search Engine Optimization Workbook For Lawn Care Business Owner Websites.” Step By Step Tips And Strategies To Improve Your Lawn Care Business Website Search Engine Rankings With SEO. If you take your time and follow the steps throughout this book, you should see a steady improvement in the ranking of your site. Why spend money on other forms of lawn care marketing when taking simple steps like optimizing your webpage titles or optimizing the images on your site can lead to improved website rankings and more customers? Don’t know what your titles should say? 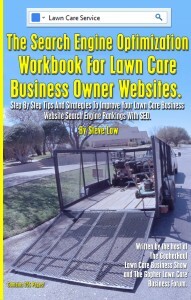 Well don’t worry, this book gives you specific examples that are designed for lawn care business websites. If you have questions along the way about website design or SEO, you can get on the Gopher Lawn Care Business Forum and ask them. Or, if you have advanced your SEO training beyond this book, you can share with us different techniques that you have learned which have helped you. No longer should you feel like SEO is overwhelming. You can do this. Just follow the steps in the book. Read the discussions and learn the reasoning why certain SEO methods work while others don’t. You don’t need to hire a SEO firm to implement these concepts, you can save your money and do it all yourself. If your website is not ranked at the top spot for your search keywords, there is search engine optimization that needs to be done. If you are not ranked in the top 3 spots, you are missing the vast majority of customers who are clicking on your competitors’ search engine links. Improve your website’s rankings and get more customers calling you!